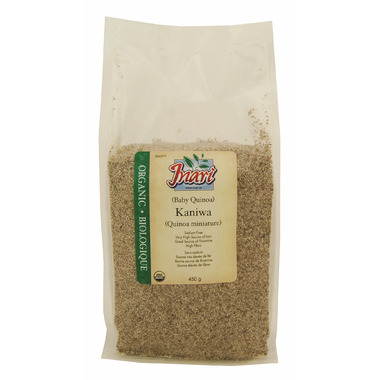 Like quinoa and amaranth, kaniwa is an ancient little seed with major nutritional benefits. Some are even calling it the new quinoa. Have you tried it yet? Kaniwa's slightly sweet, nutty flavour pairs well with fish. It also makes an excellent addition to salads, stir-fries, soups and stews. Cooking Directions: Add 2 parts water to 1 part kaniwa in a pot, cover and bring to a boil. Reduce heat and simmer, uncovered, for 15 minutes or until water is absorbed. This product may contain traces of nuts, soy or sesame. It tastes alright and kind of bland on its own, and good with lemon, olive oil, olives or whatever else you would like to put in it, but is very messy to use because the grains are so tiny. The grains are a little smaller than couscous when cooked, and crunchy which is fun in the mouth. However, I think I prefer quinoa to kaniwa and don't think I will be buying this again. I'm not sure if I cooked this long enough because there were grainy hard pebble like pieces, I think I prefer regular quinoa.